Berlin has approximately 40 % of green (parks, forests etc.) and blue (rivers, channels, lakes, ponds, etc.) areas within its borders. It aims to create connectivity across the city and a ‘green belt’ as a border boundary for urban growth and a protection against urban sprawl. Berlin has a specific multi-level administrative structure which determines how different layers of government interact and how competences are distributed. The city of Berlin (Stadt Berlin) fulfils both functions of the municipal and the state level (Land) in the German federal system. It is subdivided into districts (Bezirke) which to some extent are responsible for land use and environmental planning. Creating green solutions and infrastructure is a common goal across the different hierarchical levels of all planning in the City of Berlin which is anchored in most urban planning documents. the improvement of recreational areas within and in the surroundings of deprived neighbourhoods. It aims to combine measures for improving recreational spaces with those for improving microclimate and providing for sustainable water management (Senat Berlin, n.d.-a). the transformation of impervious surfaces into green surfaces. The concept also suggests subsurface solutions for rainwater harvesting. The concept includes physical targets for the volume of humidity for evapotranspiration to be achieved in urbanised areas. These targets are based on the calculation of evaporation volumes obtained in a forest. Half of the evaporation required will be guaranteed by increasing vegetation (green roofs, walls, pocket gardens, etc) and the other half by using stored rainwater to be evaporated on rooftops, in public paved spaces, and used for irrigating green public spaces (Senat Berlin, 2014b). 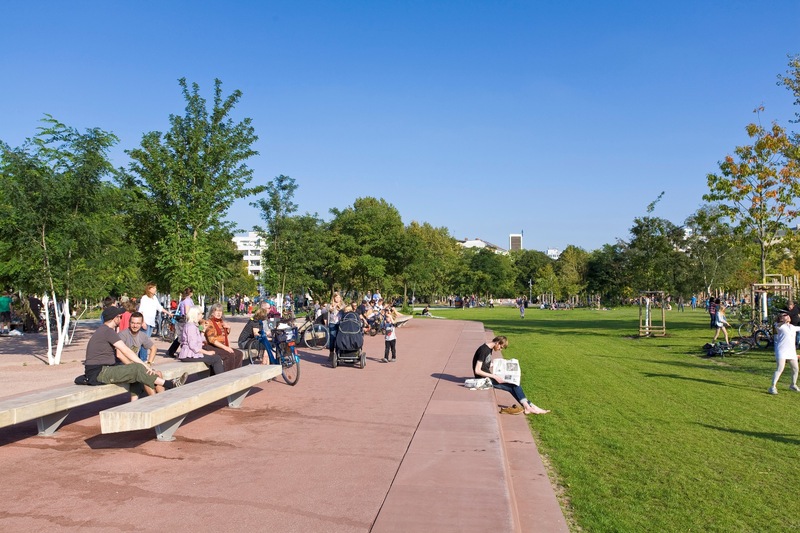 The ‘Parks auf dem Gleisdreieck’ and the Schöneberger Südgelände aim at matching the diverse recreational needs of different social groups, including, for example, nature areas, meeting places, sports, playgrounds and urban gardening. The ‘Tempelhofer Feld’ offers mainly areas for outdoor sports like skating. It has 300 hectares (ha) of wide and open green space with stretches of asphalt left over from its time as an airport. Nevertheless, this area also offers niches for other types of uses (urban gardening, playgrounds, picnic areas, etc). The GREEN SURGE Urban Learning Lab in Berlin set up a project for school gardening, in a secondary school covering all aspects of urban gardening, including further awareness about healthy food. Gardening activities were extended beyond the school area to a neighbouring vacant area (van der Jagt, Botzat, DeBellis, Cvejić, & Mårsén, 2016). Berlin has approx. 16 000 ha of forest within the city’s territory and further 12 500 ha in the surrounding area of the State (Land) Brandenburg. Berlin’s forests are gradually being transformed, replacing the predominant coniferous wood planted during the 19th and early 20th century with mixed woods which are closer to the pristine forest typical for this area. The resilience of forests to climate change will increase as a result of having a pristine mix of tree species. Berlin’s Green Walks project started in 2004 as a result of a citizens’ initiative and was adopted by the city administration afterwards. The project consists of a network of over 500 km of marked routes along 20 Green Walks connecting residential city districts with recreational areas that are protected from road traffic. This project coincides with the concept of connecting green areas, as many of the areas identified in the overarching green spaces strategies are used for the Green Walks. Maintenance tasks, including signage and trail mapping are still undertaken by a private non-profit organisation (“20 Green Walks in Berlin / Senate Department for Urban Development and the Environment Berlin,” n.d.). This bottom-up initiative for temporary use of vacant urban space for community gardening started in 2009 and aims to create a community around urban gardening and food production. It is located in the densely urbanised area of the district of Kreuzberg. The concept is based on temporary use of areas awaiting new occupancy, so only removable containers are used for gardening. The lease is periodically renewed by the city administration. The food produced is used for the garden’s own café/restaurant (“Prinzessinnengarten » About Prinzessinnengarten,” n.d.). Bottom-up citizens’ initiatives have helped to create important green infrastructure, influencing and transforming public policies. Public policies have to a certain extent tolerated and sometimes integrated these bottom-up activities into mainstream policies (e.g. leasehold contract for the Prinzessinnengarten). The BENE programme (NBS project 1) has been co-financed by EU's ERDF funding. The implementation of the Mischwald Programme (NBS project 2) was accelerated through national funds dedicated to the climate adaptation of forests (Bundesanstalt für Landwirtschaft und Ernährung, n.d.; “Mischwaldprogramm / Land Berlin,” n.d.). Financing for the Prinzessinnengarten is granted as the food produced there is used in the garden’s own café/restaurant (“Prinzessinnengarten » About Prinzessinnengarten,” n.d.).